It's hard to imagine people gathering around their radios for entertainment. Maybe it doesn't seem so strange when you consider that many now gather around their phones for the same thing. Before television, and even more than with cinema, radio truly was entertainment for the masses. It was the first time you could be entertained in your own home from an outside source. If you would like to hear some classic radio, there is a lot of it available on-line. Of interest is an archive of old The Mercury Theatre on the Air, from the 1930's. They later changed their name to reflect their sponsor and became The Campbell Playhouse. These productions were the product of a New York drama company co-founded by none other than Orson Welles and John Houseman. It was on that program that the legendary War of the Worlds was broadcast in 1938. Imagine the live orchestra and the audience. Imagine having to create sound effects by actually having to recreate the desired effects! It must have been really cool to have been there. These were live performances, something that even by today's standards would be quite an accomplishment. 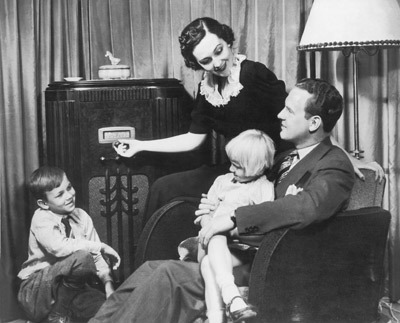 Radio plays were phased out by the 1960s, as TV was already becoming the number once source of entertainment in America. A lot of radio programs would eventually transition themselves onto television screens. There are even a few soap operas that are still around that originated as radio programs. It may surprise some to know that "radio" drama still exists. Anyone can set up their own Internet-based plays, and some are obviously more refined than others... You can even hear some radio drama on the airwaves. One show that used to be aired in Montreal is Imagination Theatre. Syndicated on stations across North America and elsewhere, Imagination Theatre does a great job of re-creating the old-feel of classic radio, along with some more contemporary stories. Some plays are even recorded in front of a live audience. Times have definitely changed since those first now-classic radio shows hit the airwaves, but the concept of entertainment broadcast for the masses has not.